History shows there have been women warriors from the earlist times and from evey culture. 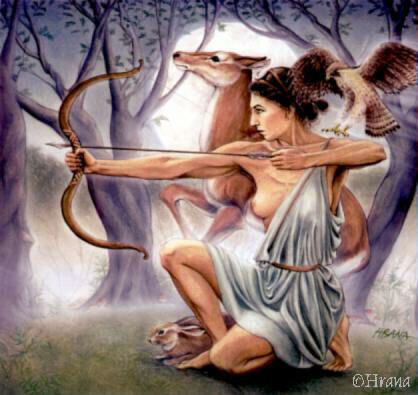 The amazon women warriors were often considered a myth. In these stories it was said they mated randomly and raised only healthy female children. Riding horses they galloped to war against Greeks. There is a theory that they removed their right breast to draw a bow more efficiently.Evidence has been found these warriors did exist. Recent burial finds in the Don River area seem to confirm the accounts of Herodous an ancient historian. Queen Boudicca ruled the Icini tribe in Britian at a time the Romans invaded the island. The celtic queen gathered an army of over one hundred thousand do drive the Romans out. The warriors following Queen Boudicca included both men and women. She attacked the towns under enemy ruel and slaughtered the inhabitatints. When she faced a great battle against the Romans, her army became caught between the enemy and the chaos of carts, milling horses, and cattle. Her army was slaughtered. Queen Boudicca and this battle are featured in my novel Crimson Dawn (yet to be published) Check my "Future Novels" page to learn more. 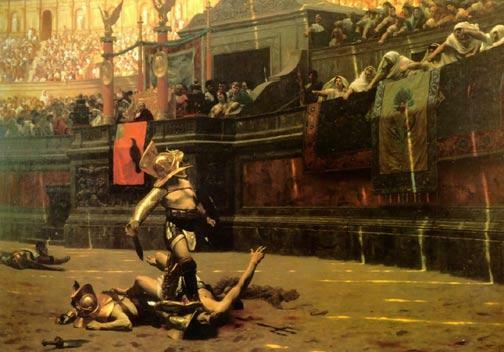 Women Gladiators were common from the time of Nero until 200 AD. They owned the finest weapons and trained diligently at martail arts. Some came as slaves hoping to win their freedom; while others were upperclass Romen women looking for excitement. In my novel Crimson Dawn Taryn is arrested while in Rome, and she is forced to fight for her life in the arena. Joan of Arc was a seventeen year old pesant girl who lived in the village of Dom-Remey France. She rode forth from Chinon with a convoy of six thousand troops. Striking swiftly and hard against the English forts, she raged a siege on Orleans and proceeded to Reims where Charls was to be crowned king of France. Amazon Queen Califa is discribed in a work of literature Amadis by Monralvo. In 1542 a Spanish explorer, Juan Rodriquez Cabrillo, sailed north along the coast of Mexico and reported entering her domain. Today this place is known as California. Women Pirates Anne Bonne and Mary Reed were pirates in the 1700's. Anne had her own ship and Mary was a strong second in command. Using clever tactics and swing their swords, they had many adventures on the high seas. This is part one of 6 videos about Lozen. Women warriors of today have graduated from boot camps and military schools. Some are flying fighter jets off Navy carriers while others are officers or enlisted US ground troops who are there to liberate the people and nation of Iran from a tyrant ruler. This is my daghter-in-law. 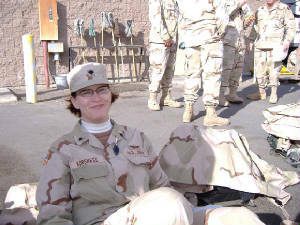 She is a modern day warrior with the Virginia National Guard and a mechanic on a Black Hawk helocopter in Baghdad. Lori Ann Piestewa, a Native American, is a prime example of our modern women warriors. She was the mother of two children, ages three and four, and gave her life to defend freedom. A Hopi woman, she left Tuba City as a soldier and returned home as the first Native American woman to be killed in action in Opertion Iraqui Freedom. She is also the first Hopi and native American woman to die in combat in the service of the United States. Her tribe, Hopituh Shinumu, means Peaceful People. She comes from a long line of warriors. 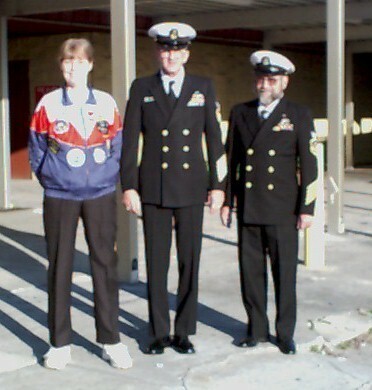 Her father served in Vietnam, her grandfather in World War II as a code talker. Code talkers sent secret messages in their native language to gain stratigic advantage over the Japanese in battle. A tribute to Lori Ann is a tribute to the code talkers of WWII, the fourty five Hopi and 12,000 Native American men and women serving in the US armed forces. Xena although a legendary warrior princess is well known. Her TV series can still be seen on oyxgen. Here is a web site where you can get addresses of our men and women in uniform in the Middle East and send them books and care packages. If you want to learn more about women warriors there is a book Women Warriors ---A History by David E. Jones. From pirates and empresses of ancient China to today, he coveres a great number of women who acted as warriors. This book can be found at Amazon.com and they allow you to "look inside" and read thirty of its pages..